Can you believe its been four months since Action Comics 1000 made an event out of being a millenarian? We’ve spent MONTHS trying to figure out what Bendis has up his sleeve for big blue. Over the last couple of months, we’ve been following The Man Of Steel – detailing Lois and Jon’s departure with Superman’s dad. Here we are finally at 1001, continuing the story from Man of Steel. Clark is alone and trying to figure out the source of the fires in Metropolis. In what could only be considered a slow start for the post-1000 times, Bendis is working to establish his style for Supes. He’s a little broken over the fact that he cannot communicate with Lois and Jon (or even find them). And frustrated that he cannot find the source of the fires. Bendis even has a beautiful redirect when a little boy comes in saying Superman started the fires. Only later do we learn that a “bald-headed” guy was responsible – leading to assumptions by many readers, I’m sure. The art style is fresh for the most part. 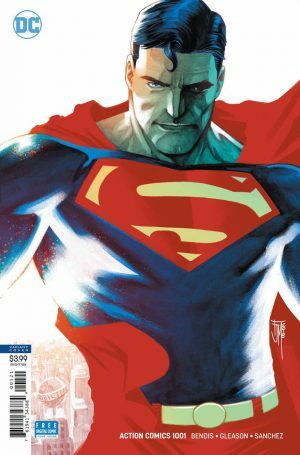 Gleason has drawn Superman as a much more brawny version of himself. Even as his Kent alter-ego: he is much more Mr. Incredible than Batman. The style of the new characters and villain are also well designed. Without giving too much away, the villain is really appropriate (and integral) to the storyline. As a recent inductee into the Action Comics Fan Club, I do see the difference in between the recent stories and the new Bendis direction. It shows promise. And it’s nice to see Superman at his emotional low. Makes for a much more human alien.